A teenager has been arrested in connection with the murder of Cameron Reilly. The remains of Cameron (18) were found by a dog-walker in a field just outside of the town of Dunleer, Co Louth on the morning of May 26. A source told the Irish Independent the cause of death had been established as strangulation. The first-year college student has been remembered as “kind, polite and gentle”. Gardai have confirmed that a man (18) was arrested in connection with the investigation into death of Cameron in Dunleer this morning. Gardai confirmed to Independent.ie this evening that the man is still being detained under Section 4 of the Criminal Justice Act, 1984 at Drogheda Garda station. Meanwhile, locals have rallied together in a plea for witnesses to come forward and for information to be shared. Addressing a council meeting last week, Cllr Colm Markey said it was a “very, very hard situation for everyone in the community”. He also said the reaction and support shown to the family speaks volumes for the close-knit community and he appealed for people to come forward with any detail. “This is hanging over the community,” he continued. Meanwhile, Cllr Liam Reilly said Cameron was a “quiet young man”, while Cllr Pearse McGeough said it was a sad time for the family and community and he urged those with information to tell gardai. “The longer it goes on, the worse it’s going to get,” he added. 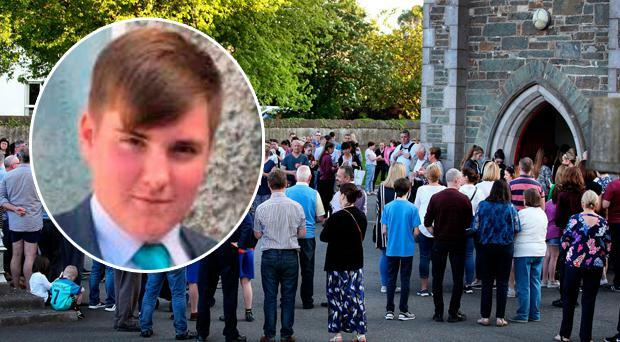 Army units and Coast Guard personnel were drafted in to help in the search for evidence in recent weeks as gardai in Louth continued to piece together the events that led to the brutal murder of 18-year-old Cameron Reilly. Two sites near the teenager’s home in Dunleer were sealed off as part of a large-scale operation. Gardai hoped their efforts would recover the teenager’s mobile phone which may hold the key to his last hours, but there is still no sign of the mobile phone. Five army units cut grass and some overgrown woodland in the area where Cameron was found as they helped with the search. They were joined by the Garda Water Unit who conducted a simultaneous operation in a reservoir in the field where they believed his phone may have been cast away as part of an attempt to conceal evidence. This reservoir was also drained to facilitate the Garda search efforts. Since the murder investigation commenced, gardai have said they believe the answer to who was involved in Mr Reilly’s death lies close to the town of Dunleer. They said they know that up to 20 youths in their late teens and early 20s were socialising in the area before Cameron was killed.